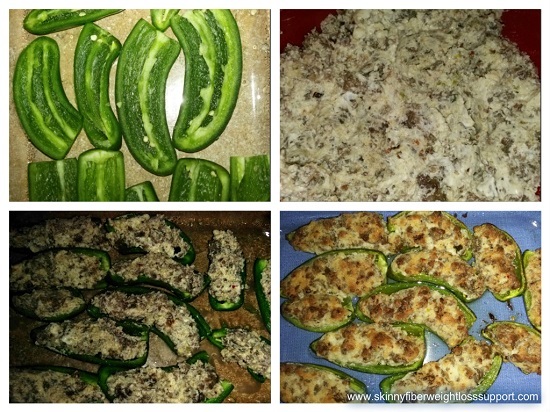 I love jalapeño poppers with both cheddar and cream cheese, so I decided to put my own spin on one of the low carb recipes from my Facebook page. Oh my goodness!!! To my surprise ... I loved them. They turned out so delicious that I could have eaten them all - LOL :) . I hope you like this Sausage Jalapeño Popper recipe as much as my family did. You can make it low carb or lower fat with either set of ingredients below --- both are equally tasty. Enjoy!!! * You can use ground turkey breast, ground turkey breast sausage, ground chicken breast, ground chicken breast sausage, lean ground beef, Morningstar ground "meat" or even no meat to make it lower fat and calories. Cook your sausage in a pan until well done. You will need to use your spatula to break it up into smaller pieces as you do with ground beef for spaghetti. Strain and let the sausage cool. * For the low fat recipe, you can first boil the sausage in water (broken up pieces) and drain out the fat when as the water simmers down and it is just about cooked through, then brown it a bit by frying. It will still be as delicious; just not as much fat and grease. Coat the glass baked dish with cooking spray, line the jalapeño halves up and add some of the sausage mixture into each (stuff them pretty well so they look like the lower left hand picture above). Bake uncovered for about 15 to 20 minutes until they look firm and little brown on top, and the jalapeños are softened but still a bright green color. Serve alone as an appetizer or with a side of your choice! Are you doing a low fat or low carb diet while doing the 90 Day Challenge with us? Please make sure to add me as a friend on Facebook and send me a message when you are ready to join our weight loss support group. We have a lot more recipes there, as well as health and weight loss tips. Participate in periodic fitness challenges and get help as you need it.